Tue., June 13, 2017, 6:19 p.m.
MINNEAPOLIS – Second-round pick Sam Carlson, a right-hander from Burnsville, Minnesota, stood on the field on Tuesday and watched the Seattle Mariners take batting practice prior to their game against the Minnesota Twins at Target Field. 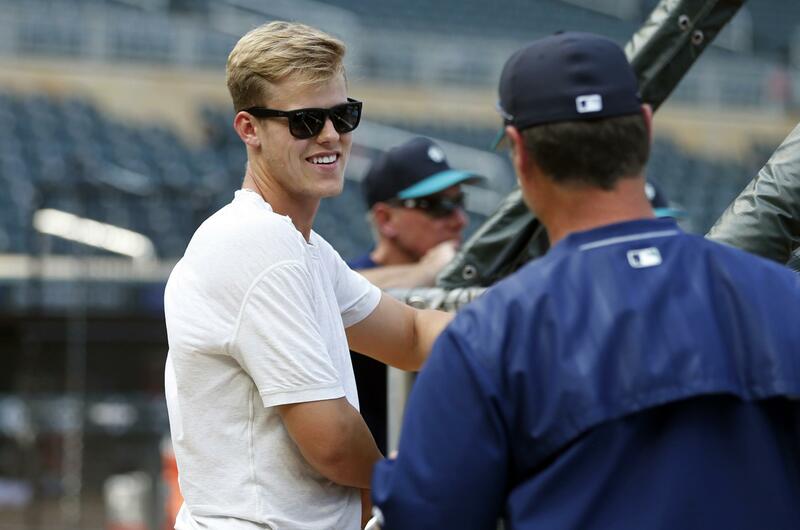 Signing Carlson, 18, would represent something of a coup for the Mariners. He ranked as the No. 15 prospect in the MLB.com pre-draft rankings and No. 21 in the Baseball America Top 500. That’s roughly a mid-first round pick. The Mariners took him at No. 55 overall. Carlson remained available, at least in part, because of signability concerns. He has a scholarship offer to Florida and didn’t figure to come cheap. The 55th pick has a slot value of $1,206,900, which means the Mariners must find another $1 million or more in their bonus pool just to boost their offer into the slot range of a late first-round pick. Doing so would require them to get several picks in the first 10 rounds to agree to sign below slot value. Some background: Major League Baseball assigns a slot value to every pick through the first 10 rounds. A club’s bonus pool is the combined value of its picks. There is no restriction in the spending on any specific pick – clubs can exceed the pool on some picks and sign others for below slot value – but penalties are assessed if a club exceeds its bonus pool. The Mariners began playing the system on Tuesday, once the draft resumed, by selecting Gonzaga sidearming reliever Wyatt Mills, a senior right-hander, in the third round. First note this: Mills, 22, posted impressive numbers for the Zags: a 1.79 ERA in 22 appearances while striking out 58 and walking just four in 40 1/3 innings. Hunter likened him to Joe Smith and Steve Cishek. “Every time I’d watch the kid’s video,” Hunter said, “it just reminded me of that. It’s a unique arm slot…He’s the type of guy who you get into the system, there’s not much more he can do but go out and keep performing. Even so, Mills seems a reach with the 93rd overall pick, which carries a slot value of $579,800. He wasn’t in the MLB.com Top 200 or even in the Baseball America’s Top 500. Of the Mariners’ eight selections on Tuesday, Mills was one of four not ranked among Baseball America’s top 500 prospects. Two others were ranked more than 100 slots below where the Mariners selected them. Only one of Tuesday’s eight picks, catcher David Banuelos, a fifth-round pick from Long Beach State, ranked significantly higher in the Baseball America rankings than his selection. Sixth-round pick Oliver Jaskie, a lefty from Michigan, was within one slot of his Baseball America ranking. The draft consists of 40 rounds over three days. The first two rounds and the two competitive-balance rounds took place on Monday; rounds three through 10 were Tuesday; and 11 through 40 are Wednesday. The Mariners selected Kentucky first baseman Evan White on Monday with the 17th overall pick before choosing Collier in the second round. Drafted players must sign by July 15. Those who don’t sign and attend a four-year college are ineligible to be drafted again until after their junior year. Those who don’t attend a four-year college can be drafted again in 2018. One catch: If a player doesn’t sign, his slot value is subtracted from a club’s overall bonus pool. So, no, a club can’t spent its entire pool on two or three players and allow the others to go unsigned. Third round: RHP Wyatt Mills, 22, is a senior at Gonzaga who was 2-2 with 12 saves and a 1.79 ERA in 22 appearances. He had 58 strikeouts and four walks in 40 1/3 innings. Fourth round: RHP Seth Elledge, 21, was 2-1 with 13 saves and a 2.59 ERA in 22 games at Dallas Baptist. He had 42 strikeouts and 13 walks in 31 1/3 innings. Fifth round: C David Banuelos, 21, was picked as an All-American by Baseball America after batting .289 at Long Beach State with seven homers and 29 RBIs in 59 games. Sixth round: LHP Oliver Jaskie, 21, was an All-Big Ten pick after going 8-3 with a 3.77 ERA in 16 starts at Michigan. He had 119 strikeouts and 31 walks in 93 innings. Seventh round: LHP Max Roberts, 19, went 10-1 with one save and a 1.44 ERA in 17 games, including 13 starts, for Wabash Valley College in Illinois. He struck out 98 in 94 innings. Eighth round: CF Billy Cooke, 21, was the Sun Belt Conference player of the year at Coastal Carolina after batting .353 with a .479 on-base percentage and a .587 slugging percentage in 56 games. Ninth round: LHP Jorge Benitez attended Leadership Christian Academy in Puerto Rico. The Mariners see him as being sufficiently advanced to start his career in the Arizona Rookie League. 10th round: RHP Randy Bell went 7-3 with a 3.69 ERA in 16 starts at South Alabama. He had 96 strikeouts and 21 walks in 107 1/3 innings. Published: June 13, 2017, 6:19 p.m.